This image is of the Kshetram (or temple) devoted to the deity Palayannur bhagvathy in the central courtyard of the Mattancherry Palace, in Kochi (Cochin), in Kerala, South India. 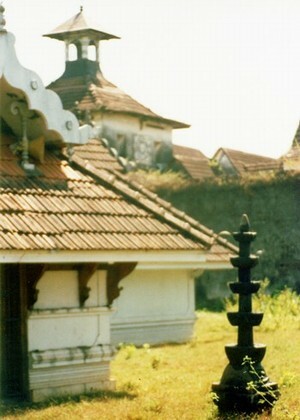 The traditional lamp or Velakku, is seen in the foreground. While the Dutch-Kochi Jewish Synagogue is faintly seen in the distant background.